...with this delicious recipe. Celebrate Winter cooking with us and Nigella! 1. Cut the fat off the chops, and then bash them briefly but brutally with a rolling pin between two pieces of plastic wrap to make them thinner. 2. 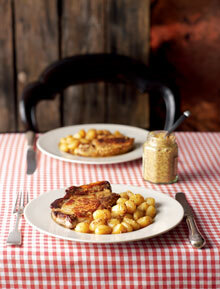 Heat the oil in a pan, and then cook the chops over a moderately high heat for about 5 minutes per side. Remove them to a warmed plate. 3. Pour the cider into the pan, still over the heat, to deglaze the pan. Let it bubble away for a minute or so, then add the mustard and stir in the cream. 4. Let the sauce continue cooking for a few minutes before pouring over each plated pork chop. If you’re having gnocchi with, make sure you turn them in the pan to absorb any spare juices before adding them to your plates. Nigella Lawson's relaxed attitude to cooking and eating have made her a household name on both sides of the Atlantic. To her, cooking is not about slavishly following recipes, but about the simple desire to make something good to eat. Her engagingly-written bestselling cookbooks have a relaxed and comfortable style; as if Nigella herself were with you in the kitchen, chatting and gossiping as you cook. Likewise, her Living Kitchen range takes familiar kitchenware and refines and improves it to make cooking an easier and more pleasurable experience. Beautifully packaged, each item in Nigella's Living Kitchen collection makes an ideal gift – if you can bear to give it away. Why not treat yourself? Limited edition Living Kitchen Measuring Cups in lavender. A special offer to raise money for the Lavender Trust at Breast Cancer Care (registered charity no. 1017658) a charity supporting younger women with breast cancer. All Nigella's royalties and an additional royalty from Bliss will be donated from this purchase. This set of lavender measuring cups looks just like something you'd sip coffee or tea from, with a handle on the side and wide brim. By Nigella Lawson, each is made of ceramic to hold a multitude of baking ingredients. Measurements are printed on the inside of the rims and come with ounce and metric conversions. Show your culinary masterpiece off to its full potential with this contemporary cake stand. This beautiful Beech Board is designed to be used with the mezzaluna chopper. Oval indentation allows chopper to cut evenly and thoroughly. Toss and serve elegantly with these beech serving hands by Nigella Lawson. Use these serving hands to serve a salad of tossed greens or a bowlful of warm pasta with vegetables. From Nigella Lawson's collection of kitchenwares, these charming "hands" have unique, cupped shapes that keep food contained while serving. This egg shaped Parmesan Grater grates the hard cheese the way it should, giving you fine crumbly shavings. A small wooden hand held grater that fits neatly in the palm for perfect ergonomics. Made from beech wood. The Domestic Goddess is back, and this time it's instant. 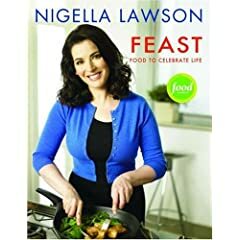 Nigella and her style of cooking have earned a special place in our lives, symbolizing all that is best, most pleasurable, most hands-on, and least fussy about good food. But that doesn't mean she wants us to spend hours in the kitchen, slaving over a hot stove. 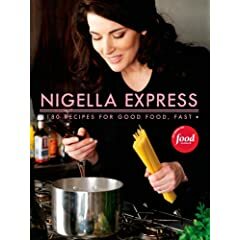 Featuring fabulous fast foods, ingenious shortcuts, terrific time-saving ideas, effortless entertaining tips, and simple, scrumptious meals, Nigella Express is her solution to eating well when time is short. Here are mouthwatering meals, quick to prepare and easy to follow, that you can conjure up after a day in the office or on a busy weekend, for family or unexpected guests. This is food you can make as you hit the kitchen running, with vital advice on how to keep your pantry stocked, and your freezer and fridge stacked. When time is precious, you canít spend hours shopping, so you need to make life easier by being prepared. Not that these recipes are basic, though they are always simple, but it's important to make every ingredient earn its place, minimizing effort by maximizing taste. Here too is great food that can be prepared quickly but cooked slowly in the oven, leaving you time to have a bath, a drink, talk to friends, or help the children with their homework, minimum stress for maximum enjoyment. Nigella Express features a new generation of fast food, never basic, never dull, always doable, quick, and delicious. 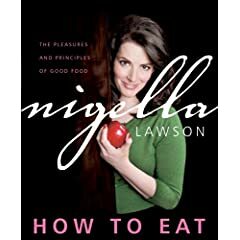 Nigella Bites--the title is taken from Nigella Lawson's Style Network cooking show of the same name--is the third book from British Vogue food editor and New York Times food columnist Nigella Lawson, a force of nature all her own. Her other books include How to Eat and How to Be a Domestic Goddess. Fans of the TV show will find all these easy-to-follow recipes familiar, and the book is even designed with pages for note taking at the end of each section. Nigella Bites is divided into chapters that include "All-Day Breakfast," "Comfort Food," "TV Dinners," "Party Girl," "Rainy Days," "Trashy," "Legacy," "Suppertime," "Slow-Cooked Weekend," and "Templefood." "Templefood" refers to the "body as a temple," and Lawson shares what she calls "restorative" recipes, like the raw egg and brandy hangover cure called Prairie Oyster. Hot and Sour Soup and Gingery Hot Duck Salad are also present and accounted for. * "Cook in advance and, if the worse comes to the worst, you can ditch it. No one but you will know that it tasted disgusting, or failed to set, or curdled or whatever." * On the proper English trifle: "When I say proper I mean proper: lots of sponge, lots of jam, lots of custard and lots of cream. This is not a timid construction ... you don't want to end up with a trifle so upmarket it's inappropriately, posturingly elegant. A degree of vulgarity is requisite."